Black Dog & Leventhal, 9781579128050, 142pp. Just in time to satisfy the kids of all ages who received Rubik's Cubes as gifts, here is the book to ensure that the gift won't go unused (or unsolved) and will help with logic, brain dexterity, and memory. Puzzle Masters Jerry Slocum, David Singmaster, Dieter Gebhardt, Wei-Hwa Huang, and Geert Hellings, share their expertise on the greatest puzzle ever created. Not only does The Cube provide dozens of strategies for competitive cubing, including speed cubing, it also shows you how to solve every kind of cube that exists: the "Mini Cube" 2x2x2; the "Classic" 3x3x3; the "Rubik's Revenge" 4x4x4; the "Professor's Cube" 5x5x5; and the largest cubes available, the "V-Cube 6" 6x6x6 and the "V-Cube 7" 7x7x7. The book even includes modular instructions for cubes of any potential size! All solutions are fully illustrated with all-new, easy-to-follow instructions created specially for this book. 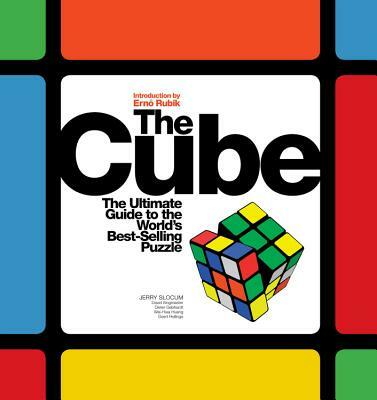 This unique book also includes a fascinating history of the Rubik's Cube from its invention in 1974 by Ernö Rubik to the '80s craze to its resurgence today, including dozens of rare photographs of vintage cubes, ephemera, and more! Packed with color photos from Jerry Slocum's extensive and unique collection of mechanical puzzles, The Cube is a must-have companion to the ultimate brainteaser. Dieter Gebhardt has published over 70 articles on puzzles and is considered a leading expert in the field of rotational puzzles. Geert Hellings began collecting rotational puzzles in the early nineties and is currently the President of NKC, the Nederlandse Kubus Club (Dutch Cube Club), an association with 500 members from all over the world. Wei-Hwa Huang is a four-time World Puzzle Champion and one of the first few people in the world to have solved an actual 6x6x6 and 7x7x7 Cube.